We are confused about what we want to do with our lives and thus what we should be majoring in. Currently, we are majoring in Course 21E, or Humanities and Engineering. It is a super cool joint major that allows you to combine any Engineering field and any Humanities field. 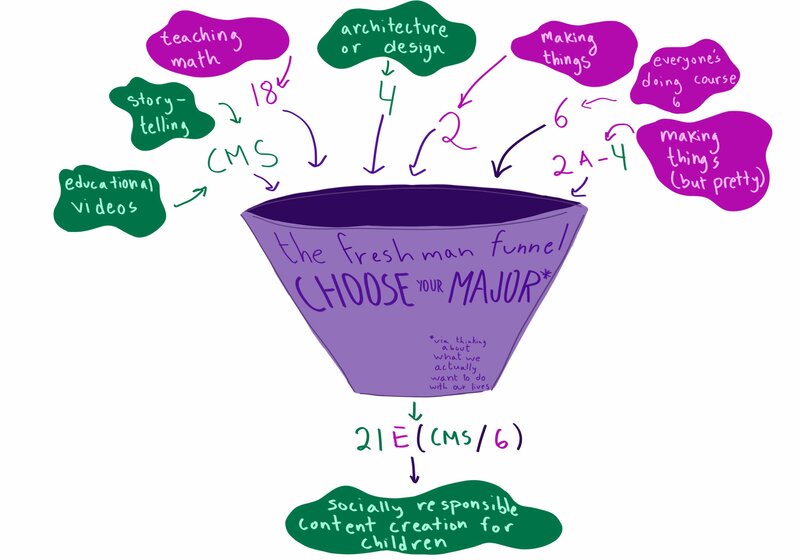 It’s different from a double major because, well, it equates to the units of one major, and it achieves this by cutting requirements from both the Humanities field and the Engineering field you chose, making it really flexible. Our humanities field is CMS, or Comparative Media Studies (which is a really broad major too; we are interested in the storytelling and writing classes offered in it). And our Engineering field is Course 6, or Computer Science. We chose this major by thinking endlessly about what we want to do with our lives during freshman year. We realized that what impacts us most (thereby what we want to contribute to), is and always has been animated cartoons and movies. A well written and beautifully animated story just hits us in the heart the way nothing else can. Another HUGE factor is that this medium has the power for real social impact, through identity representation, and that is EXTREMELY important to us. Steven Universe, in our opinions, is the epitome of the epitome of using animation to not just tell a compelling and thoughtfully crafted story, but also a very socially relevant and revolutionary one. The field of visual storytelling is really broad and encompasses mannnyyy industries, including the animation, video game, and VR/AR industry. And within these industries are loootttts of types of jobs, from purely technical to purely artistic to literally everything in between! Here is a diagram to slightly better (but definitely not comprehensively or perfectly) depict the range of possibilities. And it also shows why even with the significant narrowing down we accomplished in freshman year, we are still mostly just utterly confused about how exactly we want to contribute to this field, and hence about what we should be majoring in. We initially chose 21E to get a taste of both CMS and 6 to try to figure out where on this diagram we want to fall. But now, with a year into trying out both fields, we realized we like CMS a lot more, and course 6 stuff just kind of drains us because it is sooooooo hard and time consuming. So the biggest question we are trying to answer now is: should we stick with 21E (doing both course 6 and CMS stuff) or just drop the course 6 part of our major and switch to CMS entirely? The major we stick with will impact what skills we continue gaining and thus what career we can go into. And the career we envision we want will impact our choice of staying in our current major or switching majors. After 2 years at this technical ‘tvte, we have realized that we are just not all that passionate about purely technical things. And it took coming here, a place where a lot of (not all, but a lot of) people do and love doing really technical things, to figure out that we just don’t. Yes, we still really like STEM stuff (cause you can get some pretty cool results while having fun in the process! re: this post). But what drives us, and this has become evident through the animation classes we have taken at MassArt, where we are at home surrounded by people that look at a beautifully animated sequence the same way we do, is visual storytelling. So, it seems like the easy and obvious decision would be to just switch to CMS entirely, and dedicate all our efforts into trying to get a storyboarding job, or another one on the art end of the visual storytelling production pipeline. But it’s not that easy. 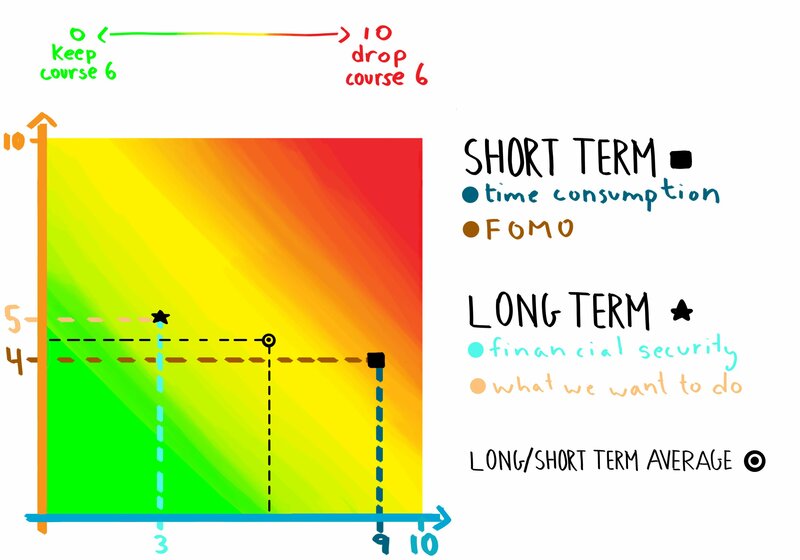 We are thinking about a lot more factors, such as financial security, FOMO and more, all of which we decided to depict more clearly by graphing on a plot. This graph is looking at the short term and long term factors we are considering when thinking about whether or not we should stop doing course 6. Both axis go from 0 to 10, 0 being “we should definitely not drop course 6” and 10 being “we should definitely drop course 6.” We thought about each factor independently, and gave each a ranking on the scale. We then graphed all four factors, grouped by short and long term, along with a point indicating the average of all the factors. Points that land in the red area indicate we should realllyyy drop course 6. Points that land in the green indicate we should reallyyy keep course 6. And in the yellow means it is unclear. With a glance at the graph, you can see why we are confused. Below, we describe our thought process while ranking each factor independently. Fear of missing out. The vast majority of MIT undergraduates major in something technical. Finding and working with pset buddies, walking over to exams in huge lecture halls, supporting each other during low points, complaining about confusing topics or psets, throwing cry parties after awful exams, celebrating being done with a pset or exam. These are all things we’ve done over the past two years, because of the types of classes we’ve taken. Although we may not have consciously thought about it during the process, the nature of the classes we took really shaped how we spent a lot of our time here. So, if we switch to CMS and stop taking technical classes, we’ll be writing essays in our room instead of doing psets in pset parties, we’ll be in the library instead of office hours, we’ll be reading alone instead of studying with peers. Granted, it won’t be as solitary of an existence as that last sentence may make it out to be. We’ll be able to work on a lot more groups projects, we’ll be able to have more discussions in our smaller sized humanities classes, we’ll be able to know everyone in our major (since CMS is so much smaller than course 6), and also engage in dialogue and develop connections with acclaimed professors and faculty members in the department. We gave this a 4 on the scale, because while we will miss out on and oddly* miss part of that quintessential** MIT experience, we will still have the opportunity to do other cool things. Another thing associated with the fear of missing out: MIT is THE place to study STEM! And we just feel that if we do stop doing course 6 things, the thought that we did not gain enough technical skills would be buzzing in our heads, like on a daily. MIT is so special because of the wonderfully brilliant, passionate, helpful and down-to-earth people that walk its halls. As mentioned earlier, we primarily learned how to code better from TA’s and LA’s, all of whom are students here and most of whom are undergrads. And we don’t want to leave this place regretting not learning as much as we possibly could have with and from our peers. *there have been sooooo many times over the past two years when we just never wanted to look at another pset or exam again, but still there is something satisfying about getting that stuff done, and struggling through it with peers.  **everyone’s MIT Experience varies and there is no typical one. However, the stuff that we feel we’d be missing out on (as we described^) is the stuff that the majority of MIT students do on a weekly basis, as the majority of MIT students major in something technical. This is the biggest thing we are considering, in terms of the short term. 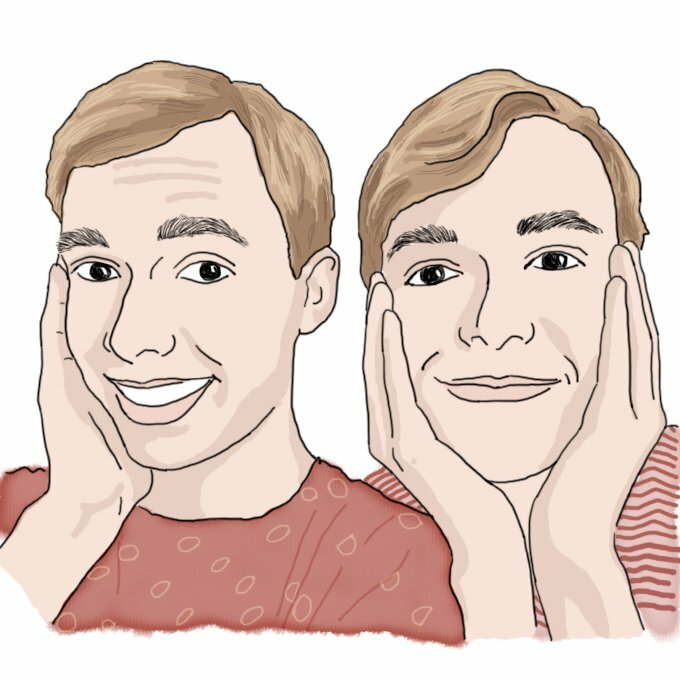 We have only completed two course 6 programming classes thus far: 6.00 (Intro to Computer Science and Programming) and 6.009 (Fundamentals of Programming). Both classes were very similarly structured, where each week you get assigned a new lab/pset. We approached both classes in the same way, by living in office hours and learning from TA’s and LA’s, because lecture for both classes was not helpful (because of a combination of not being morning people, just lacking focus, and the instructors usually going through the material too quickly, at least for us). For 6.00, we spent 15-20 hours a week in office hours, and we thought that was a lot until we took 6.009. In 6.009, 20 hours was a good week, and there were a couple that got us close to 30, and the worst one took us around 35. All this effort, and it resulted in barely passing! We both got C’s in 6.009 by the skin of our teeth, and we spent more time on this class than all our other classes combined, which, while is frustrating to say the least, is something we’ve come to accept about MIT classes. You just have to try your best, and even if you end up with a suboptimal grade, be proud and revel in the fact that you learned so incredibly much through the struggle. Don’t get wrapped up in the letter. The next class we plan to take, since it’s a prerequisite to the two classes we actually have our eyes on (Computer Graphics and Computational Photography), is Elements of Software Construction or the infamous 6.031 (or, 031 for short). On average (based on end of semester surveys), students spend 10.1 hours/week on 6.009, while we spent on average 20. On average (based on end of semester surveys), students spend 20 hours on 031. So, doing the math, we’d most likely spend close to 40 hours on 031. HA, usually taking FOUR classes is supposed to equate to that amount of time! Besides that, continuing on the course 6 path will generally allow us much less time to take electives in other departments that really interest us (like 4, WGS, and 21W) and cross-registering at MassArt. Below are two potential courseroads, one for the minimum amount of classes we need to finish the 21E degree and the other the minimum amount of classes we need to finsih a CMS degree. With just a glance, you can see the CMS option has much more free room, especially considering that every course 6 class we do not take frees up *significant* time. Now, the reason we scored this a 9. We just gave you the number of hours we’ve spent on our computer science classes. But we didn’t describe yet our mental state during those hours. Honestly, it was not great. Spending so long on a pset/lab is just mentally draining. It was especially bad when we would spend literally 2 hours just trying to understand what the question was even asking! No matter how much MIT has humbled us and no matter how much we’ve come to terms with Not Knowing Things, it is still demoralizing when you need to be hand held for literally every step of a problem. We’d be lying if we said there weren’t times that we had to leave office hours to go to the bathroom just to cry or compose ourselves from frustration. After our most recent and vastly unsuccessful job hunt, we realized that many companies are looking to hire specialists, those who can do one thing really well. That one thing for a lot of companies is coding or software development. 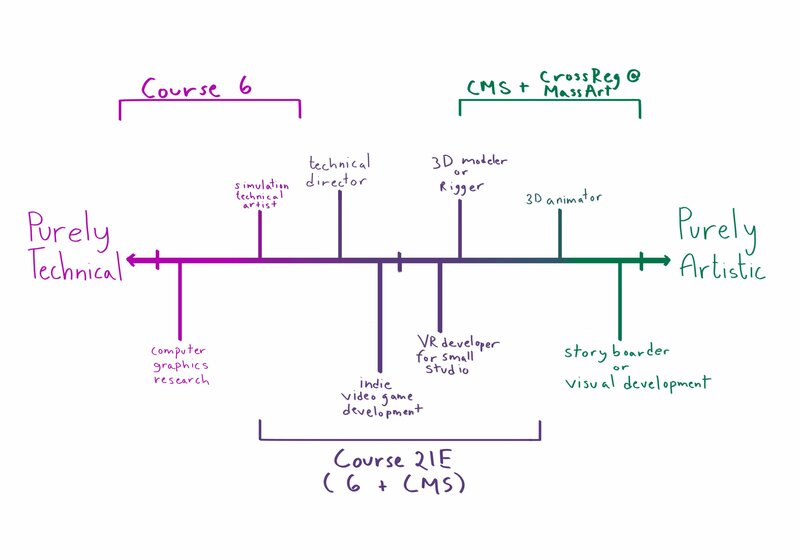 Specifically, we were looking at a lot of jobs in video game companies, animation studios, and VR companies, and even many of the more “artistic” leaning positions (such as those in the purple region of the second graph of this post) required you to demonstrate a pretty heavy amount of programming skills or background. We definitely feel that if we were to continue on with doing course 6 classes, even if barely passing the classes will be an uphill climb, we will learn a LOT in the process. And maybe that’s enough to be more hirable, and maybe that makes it worth sticking with course 6. However, there is a doubt that we’ve talked about a lot with each other. Even if we do stick with all these course 6 classes and even if we do get a lot better, we still just won’t be good enough. And maybe that’s true or maybe that’s what being around so many people who are really amazing at course 6 made us believe. Regardless, that thought always leads us to thinking that it might just be better for us to stop taking course 6 classes, and to use the extra time we’ll have to try getting an artistic job (such as things in the green region of the second graph of this post) rather than a technical one. It leads us to thinking that continuing course 6 classes would actually lower our overall chances at becoming hirable. We’d be devoting most of our time and energy into it and probably end up being mediocre, as opposed to devoting all that effort into art — something that we already have more experience and passion for. In summary, we think about sticking with course 6 in two ways — sometimes in an optimistic-everything-will-work-out way, and other times in a pessimistic-we-will-never-be-good-enough way. We gave this a 3, because we were in an optimistic mood while writing this post. This is really the core of the issue probably. We have a lot of ideas for who we want to become. We can see ourselves being storyboarders or visual development artist or animators or writers. But we can also imagine doing something more technical, in a studio whose artistic vision and ethos we trust, being equally rewarding. We’d know we are contributing to making a beautiful and useful story come to life, and that will be enough. Being indecisive doesn’t help, so we scored this a 5. Writing this blog and making these graphs definitely helped us really organize our buzzing thoughts about this subject. However, the long term factors and short term factors landed too much in the yellow region of the graph to make our decision clear enough. What we are saying is that we are still pretty confused. Our plan is to take it one semester at a time, and see where that takes us. And, of course, write about the journey here.